Like in April, I processed the downloaded Dotlan data for May 2015. There is a problem though. 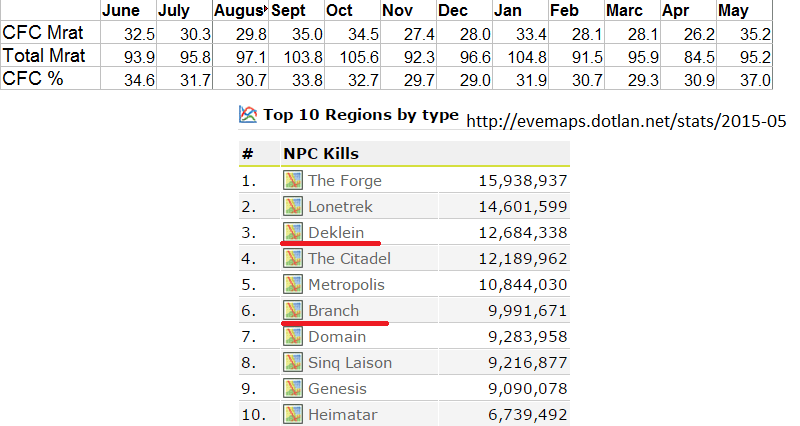 On 05/19/15, there were 3580854 highsec kills. The next day: 303252. Same drop in lowsec and nullsec, without online player number drop on eve-offline. It can only be an error at dotlan, so I omitted these data from the graph to avoid it ruin the trendlines: Highsec and lowsec stagnated in May, but Nullsec ratting risen a lot. Where? Deklein and Branch, the main CFC ratting lands saw increase like never before. Vale of the Silent also grew, getting to top 5. 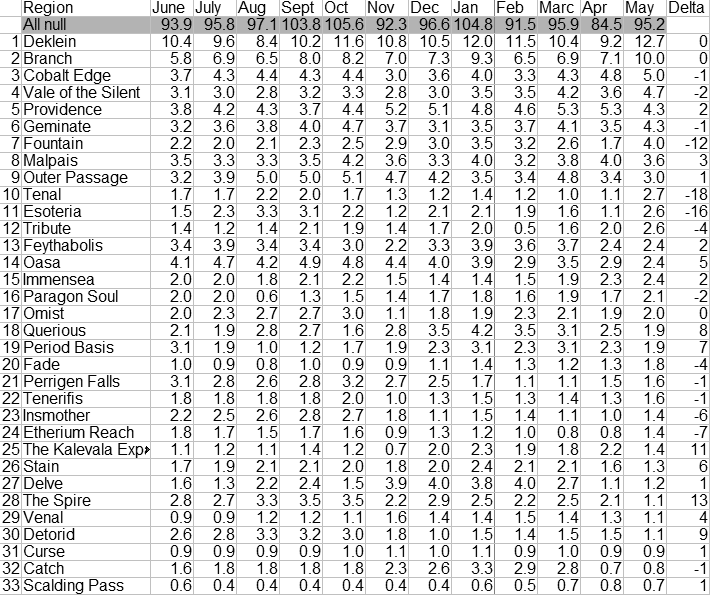 Cobalt Edge of XWX increased too, while Providence lost some ratting. Tenal ratting more than doubled since INIT was settled there. Other winners were Esoteria and Fountain since the new owners arrived. You already see where it goes. Both in absolute and relative numbers, the Imperium of Evil broke the records and ratted more than ever. More than 1/3 of the null rats (with their bounties) fell to the minions of Evil. I had to check this on the unprocessed Dotlan stats and there was no mistake. The two main CFC ratting lands beat several highsec regions. While they suffered unmatched losses on the battlefields, they managed to increase their signature activity by large. Same thing here: CONDI, FCON, SMA, BASTN and INIT ratting grew a lot, often breaking records. It's also worth noting how condensed the CONDI (Goonswarm) ratting became. 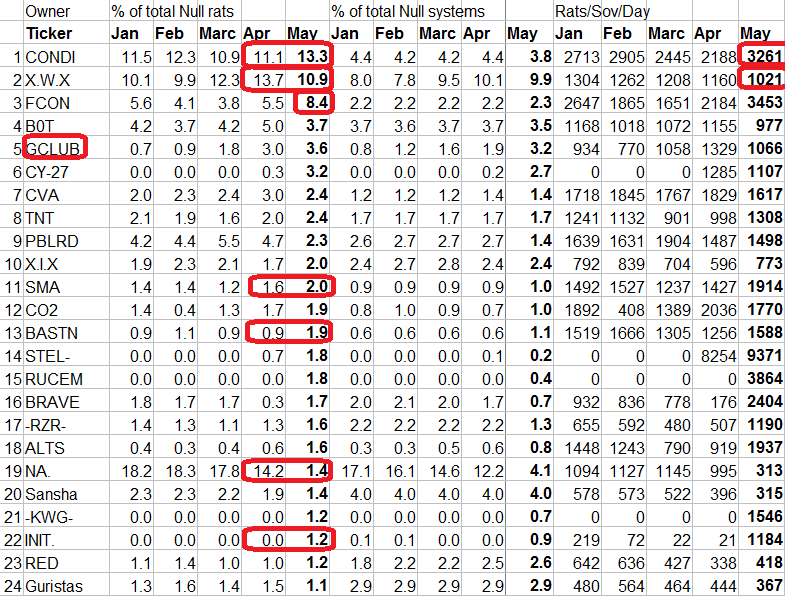 3x more rats die in their systems than in an average Nullsec system. This is the opposite of XWX, which has much more land than ratters. NA, B0T and PBLRD are dropping fast, due to closures, the only interesting data remaining is GCLUB, which climbed to top 5 with fast ratting growth. Sad news indeed. Something must be done to stop the Imperium of Evil from getting even more ISK by their unmatched fervor in carebearing. So it appears MOA really didn't have an effect on Deklein ratting. You could argue the fact "MOA deployed elsewhere because X (when really waffles just bullied them out), but before deployment Deklein ratting had declined drastically!". However, the CFC has been deployed, not many but small numbers of alts were still in Deklein. Now that they have returned home it is expected that ratting numbers return to these statistics. The Imperium absorbed PBLRD so the number of fulltime ratters has increased? I expect in the next month, you'll see the ratting in Querious pick up as well, since we're not down there anymore. It seems like evidence pointing towards small scale pirates not having any effect on the CFC after all. PBLRD corps joining can't be the cause as PBLRD was always counted as a part of the CFC. Not sure what the next step is, it seems like this isn't really having any effect. ok, ratting numbers increase again after deployments have ended and people are back in their home territories. Sure, one bad monthly data is the end of the World. I just quit EVE now. I sure as hell am no goon propagandist. I am sure they will have a prefessional for that crap. I am solely interested in how you spin your narrative. 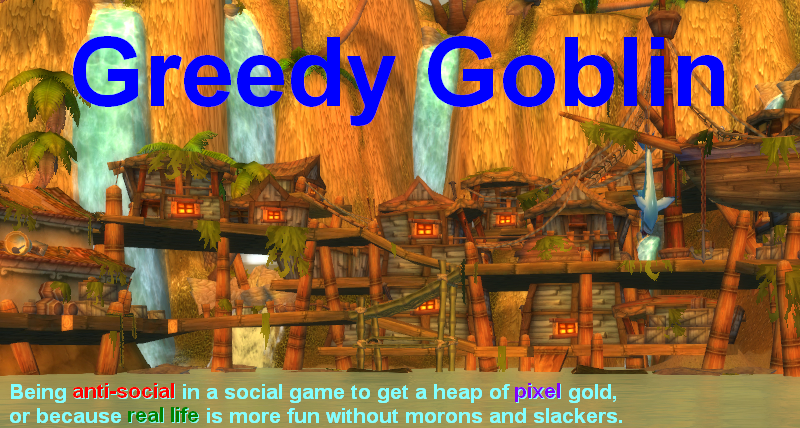 You have told us regular blog readers about M&S in MMO. Now, many people have told you that simply ganking goon ratters won't sustainably affect goons. You refused to listen. Compared to other 0.0 powerblocks, goons seem to be in beeter shape than anyone else. Again and again you have complained about these large alliances and their need for srp because in their hearts, all 0.0 dwellers are pure carebears and stupid f1 pushers.... Now, that might be true or not, in that they do not differ from hisec carebears, only that they usually are safer and can reach better income. Still, live in 0.0 comes with high opportunity costs which makes it often unattractive for people who have truly understood EVE mechanics. All emotions aside, you spent an obscene lot of isk to fund wellfare pvp of MoA, simply because they share your grudge against goons. So far, despite considerable numbers that look awesome on MoA's killboard, no significant drop in goon activity, influence or power can be perceived. And you have repeatedly mocked people who repeat and repeat strategies/fits/activities that were unsuccessful? How does that fit in your narrative? @99smite: MoA just broke their record killing CFC. CFC ratting kept decreasing in the last months. This month is a setback, no doubt. Also, consider the alternative: I didn't do the project and CFC members have now 3T more ISK. Wouldn't they be more powerful? Or you claim 3T makes absolutely no difference? 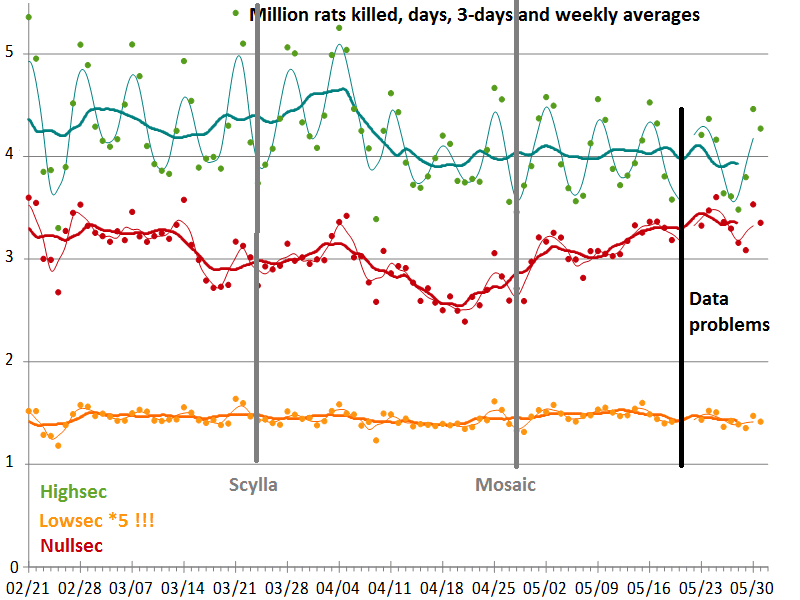 Ratting (and mining) numbers are also up because the Imperium is grinding up indexes for FozzieSov defense I think.